For a work project, I’m using a nodeMCU, which is an ESP8266 module flashed with a Lua interpreter (and put on a nice PCB with USB serial and stuff). By the way, ESPlorer is a really nice interface to the nodeMCU. I started by following an Adafruit tutorial to get WiFi working, which was easy enough. Then I hit an issue where it would silently fail to complete HTTP requests. No obvious errors – it just wouldn’t work. The callback function to print the response wasn’t being called. Pretty simple – create a connection, set a receive callback, connect to an IP address and set a GET request. This worked for me with the Adafruit website, but when I tried to do the same thing with a different domain name, nothing came back. API calls are asynchronous. There is no waiting for them to complete. Application programming must wait for callbacks, not assume completion. The connect() function is an API call. The Adafruit code shouldn’t just call send() straight afterwards – it has no gurantee that a connection has been made. to_send ="GET /testwifi/index.html HTTP/1.1\r\nHost: www.adafruit.com\r\nConnection: keep-alive\r\nAccept: */*\r\n\r\n"
The actual issue is because when given a domain name, the ESP8266 has to do a DNS lookup. This takes time. If the send() method is called before the connection is made, it just fails. So, this is a lesson. Wait for the callback from every API call with one attached, no matter how trivial. 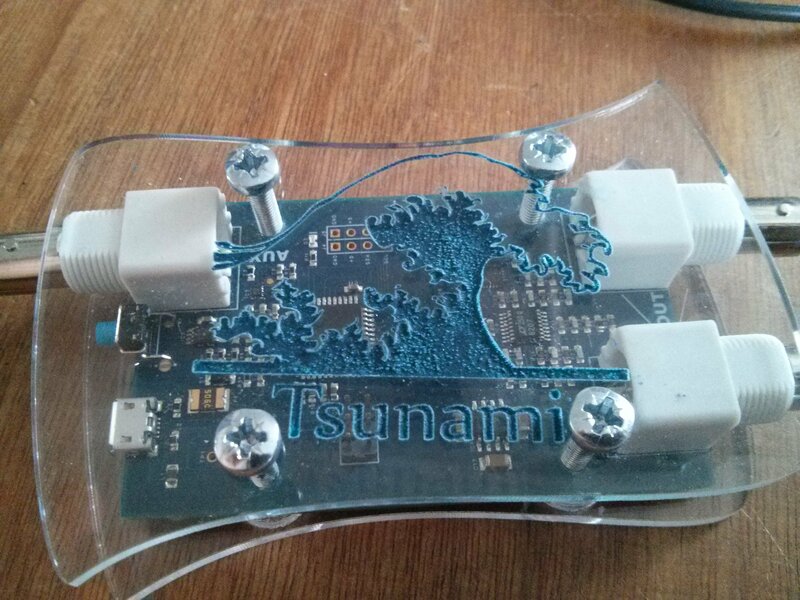 I recently got a Tsunami signal generator from Arachnid Labs. I could have got a proper case for it, but instead I thought I’d make my own. 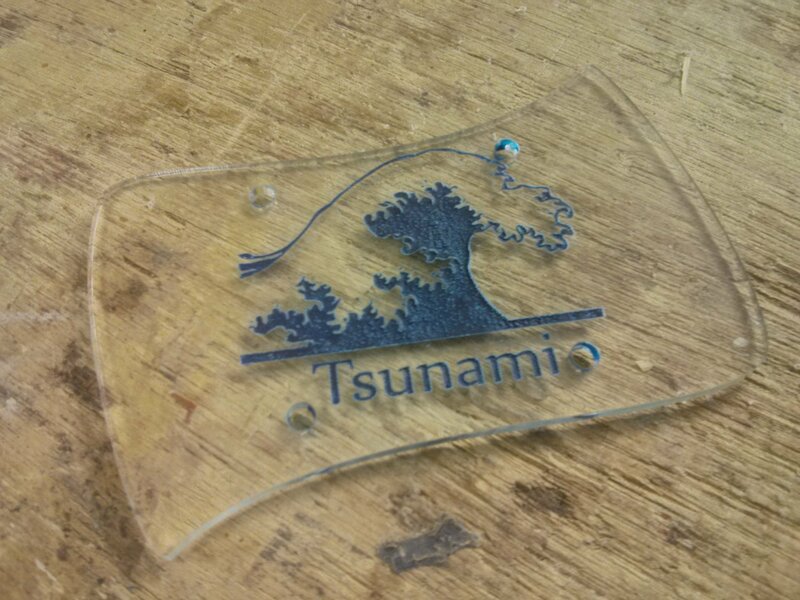 I really like making simple lasercut cases, so I threw together a “wave-like” design, cut entirely in 3mm clear acrylic. The top and bottom of the case are identically shaped. 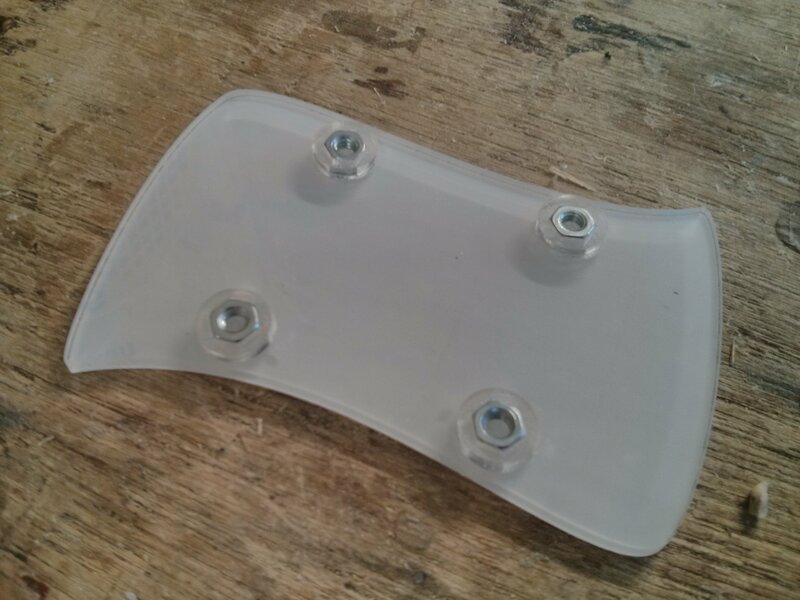 In order to raise the PCB off the bottom and allow for mounting nuts, I cut four standoffs to hold M4 nuts. The base has four etched areas to locate the standoffs. Holes in the top of the case allow M4 screws to pass through. 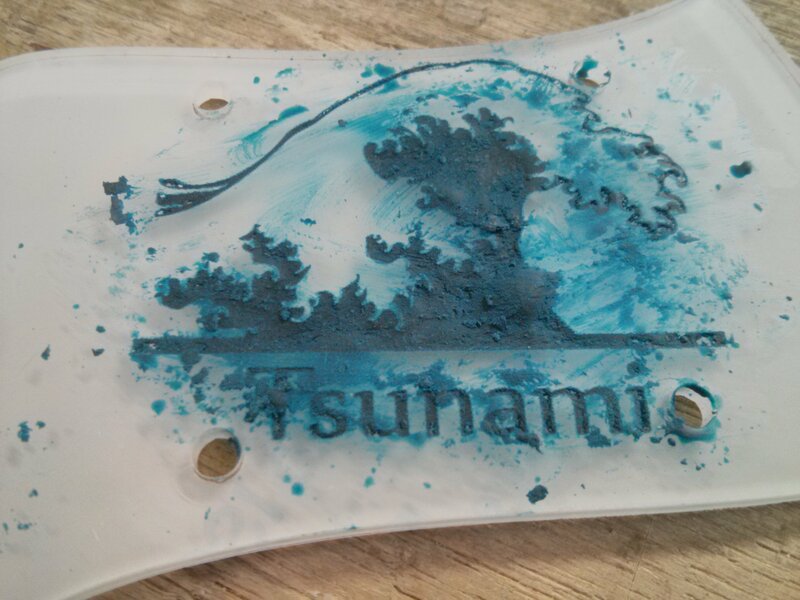 The top has the tsunami logo etched into it, which I got from their Github page. The base with standoffs and M4 nuts. I chose to leave the wax slightly underfilled to allow the roughness of the arcylic etch to show through. This sort of goes well with the “turbulent” nature of the wave image. Design files at my github. There are many, many blogposts and videos about how to convert a bitmap image into a KiCad module for putting on a PCB. None of them worked for me. I eventually got it working with a slightly altered workflow. Since KiCad changed its library format some time in the past, I thought maybe that Bitmap2Component still produced legacy libraries. So I changed the Plugin Type from KiCad to Legacy in Preferences->Library Tables. After much swearing, I finally figured out what I was doing wrong. 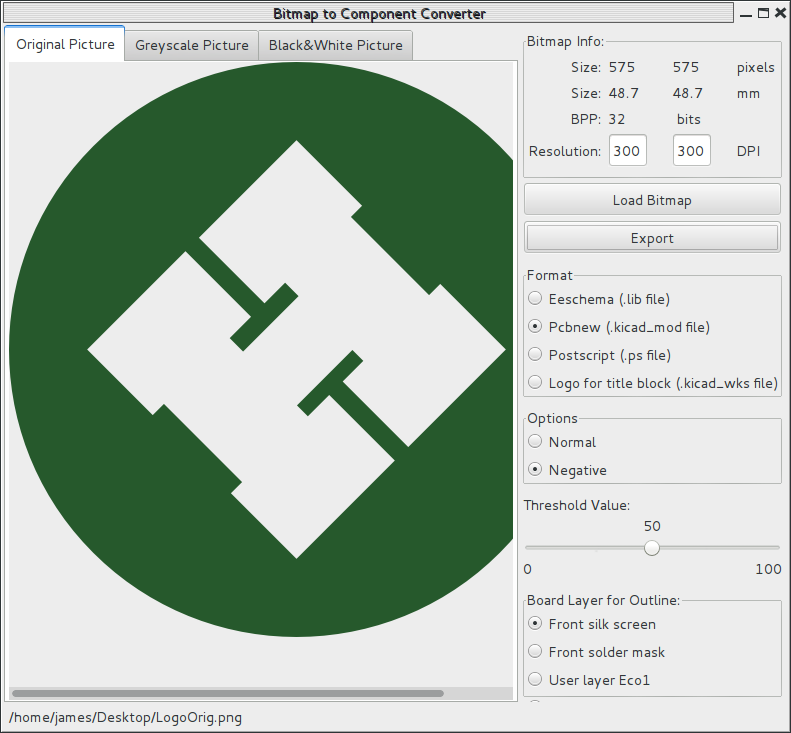 Bitmap2Component DOES produce the current (not legacy) module files. But Library Tables expects the path of the folder they’re in, not the path to the module itself. 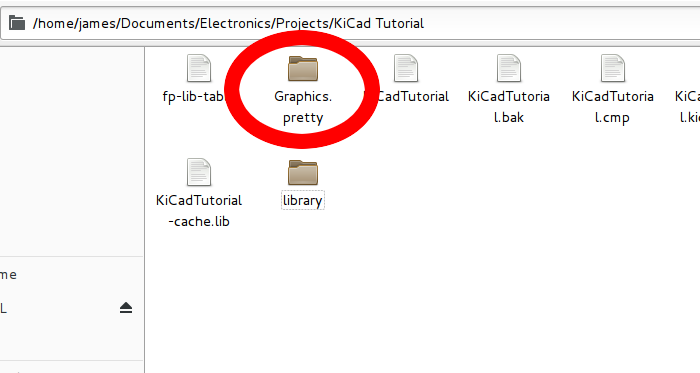 This is why KiCad has the .pretty folders. They’re full of .kicad_mod files. 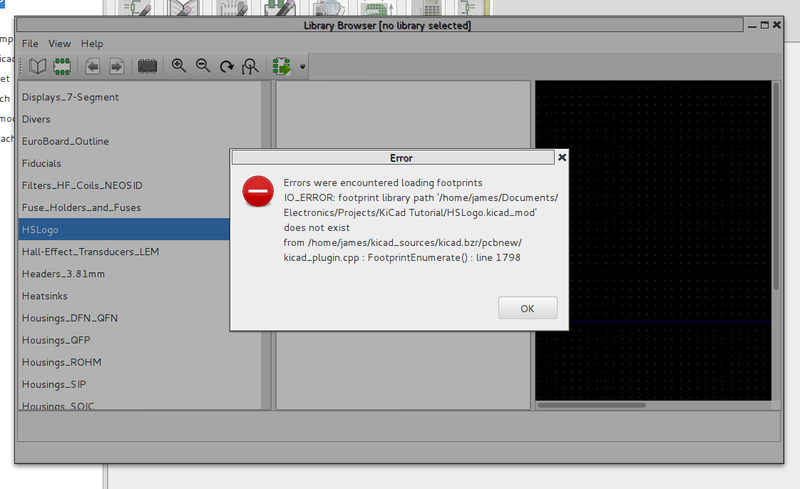 And then I changed the Library tables path to point at that folder (with the KiCad plugin type). After that, success! Apart from image scaling, but that’s a ranty blog post for another day. Those who take an interest in such things will know that Just Add Sharks have released a new breakin board for replacing “standard” Leetro controllers with your own. My preferred PCB design software is Eagle. The free version of Eagle. The free version of Eagle is not for commercial use. The free version of Eagle only has a board area of 100×80. While the first reason is probably not much of a concern personally (I doubt Cadsoft will come after me for the footling amount of money I would make), the second limitation is an actual limitation. I have previously blogged about whether to go for KiCAD or Eagle, but this job made the decision for me. KiCAD it was. It was my first project in KiCAD, so I had a lot to learn. 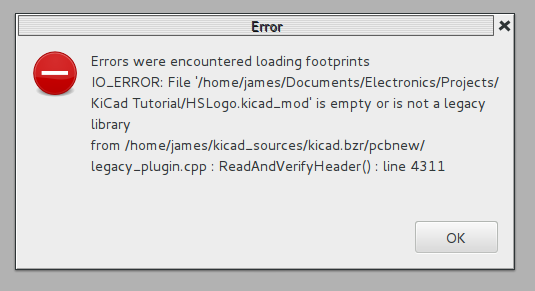 The main sticking point was around how libraries work, but that seems to be a common thing for new KiCAD users. 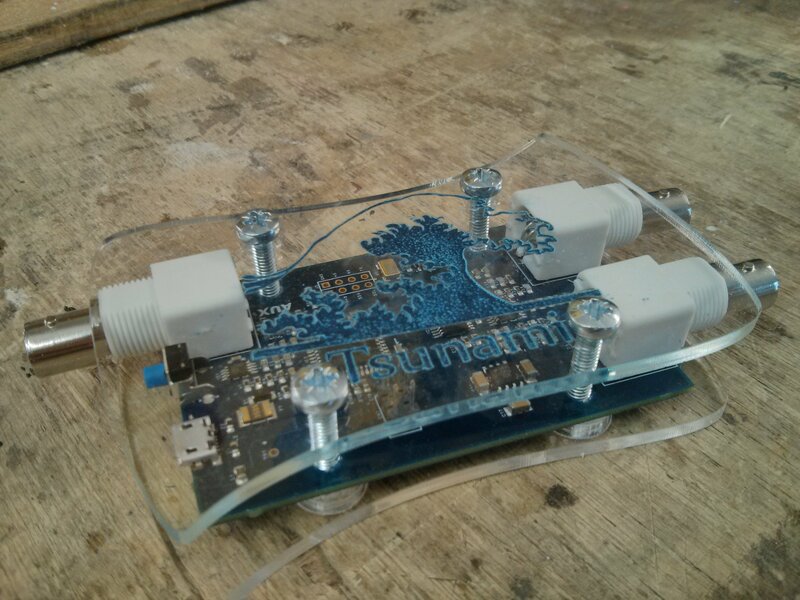 The only thing I had to actually ask about was how to hide silkscreen (or objects in general) on the PCB. Each component has a name and value on the silkscreen, but I didn’t need these things. How do I hide them? Well, the answer’s here. You toggle the visibility of the layer in the “Render” tab. The only thing I wish I’d done was ask if I could put “PCB layout by James Fowkes” or something on the PCB. That would have been an indulgence, but a nice indulgence. Most people who know me will probably be vaguely aware that I consider myself a feminist. I probably make loads of mistakes while I’m doing it. I am far from perfect. But just to make it abundantly clear: hell yes feminism. I use Eagle for my PCB design and I generally find it to be a nice piece of software. 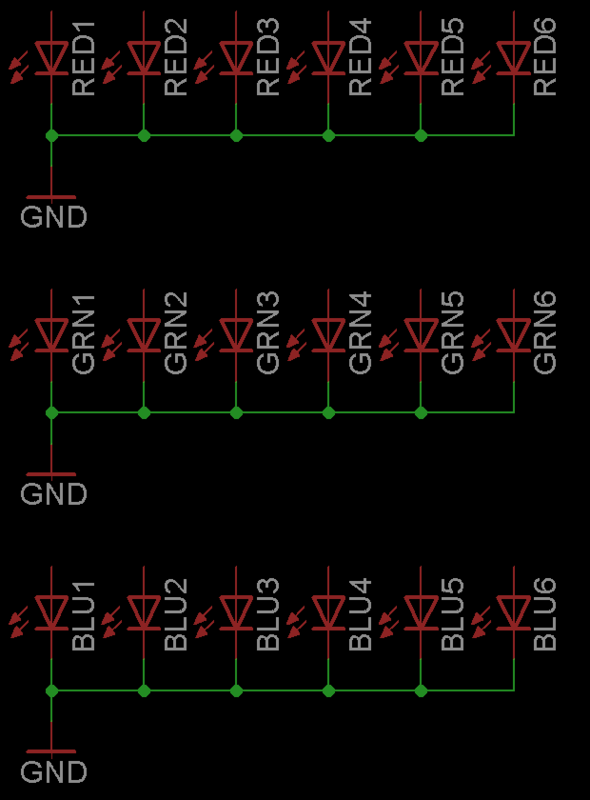 One annoyance that I came across recently was the seemingly hard task of doing a “bulk rename” of components on a schematic. I tried searching for how to do this, but couldn’t find an answer that did what I want. This is boring, slow and error-prone (about 5 minutes). This is slightly less boring and error prone (about 2 minutes 30 seconds). I couldn’t find any way to perform the last bit (a bulk rename), so I looked into writing my own ULP (User Language Program) to rename a group. The ULP would take a prefix, number and optional suffix as input. Then with the currently selected group of components, rename each using the fixed prefix and suffix, with the number incrementing each time. For example, the inputs “RED, 1” would rename the selected group “RED1, RED2, RED3, …, REDx”, where x is the last component in the group. The inputs “U, 10, A” would rename the selected group “U10A, U11A, U12A, …, UxA”, where x is the last component in the group. The ULP for this only took 45 minutes to write by referencing (copying from) the examples and existing ULPs. It shows a confirmation box before committing (the individual rename operations go into the undo history as well). This script reduced the time it took to create the schematic in the picture above to 1 minute 15 seconds. I think this will save me a lot of time. The ULP is available my Eagle github repo. Trigger warning: this post discusses depression in some detail. It is not written by a mental health professional. Sufferers of depression and similar conditions should think carefully about playing the game it discusses. It is intended to raise awareness and aid understanding for non-sufferers. If you think you may be negatively affected by the game, get a professional opinion or try asking the developer before playing it. Recently, through the actions of some very thoughtless and blinkered people, I became aware of a person called Zoe Quinn and a game called Depression Quest. I wonder how many other people have “found” this game through the reaction to the whole #gamergate thing. I hope it got a lot of traction from it. It might make up a tiny bit for the horrific abuse that the creator endured. I’ve just finished a play-through of the game. Before I go back again, I thought I would share my first reactions. It’s a deeply emotional game. I don’t have depression, but I know people who do. Before starting, I wondered how this might affect my choices in the game. As it turned out, I don’t think it did, much. At almost every choice, I found myself thinking “Well, this is obviously the best way to go. This will obviously help.”. This says a lot about how difficult it is to put myself in the mindset of someone with depression. The obvious, rational choice can seem stupid, overwhelming and terribly scary. I know this, and yet still I found it hard to not pick the “obvious” (to me) choice. Therefore, at the end of my first play through, my character got an “doing pretty well” ending. I’ll be playing through again (and again), in the hope of gaining a deeper understanding of how things can go. As the “ending” of the game says, there is no real end.